We know that quality means safety, consistency and performance for our customers. That’s why we’re proud to have set the standard in these areas, and gone beyond, through our comprehensive and fully-equipped Quality Assurance Lab that includes such technologies as X-ray machines, video microscopes, optical comparitors, hardness and tensile testing and chemical and environmental testing. Quality means more than just a well-made fastener. 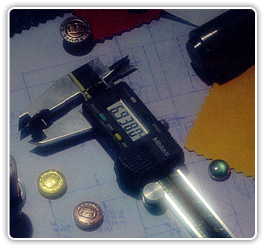 It means each fastener has met the most rigorous testing and quality control measures. Automotive, Aerospace and Medical are just a few examples of industries that must adhere to stringent regulatory demands. Scovill products meet or exceed regulatory standards to ensure durability and prevent product failure. We also offer full compliance of EU and USA regulations. The CPSIA (US Consumer Product Safety Improvement Act) of 2008 provides for a maximum allowable lead content of 100ppm, however, Scovill’s internal standard is 60ppm or less. In other areas, we exceed regulations set for separation strength- once again going beyond what is required by industry standards.